ZAMBOANGA — Elim­i­nat­ing for­eign ter­ror­ists and their safe havens in the south­ern Philip­pines is the No. 1 pri­or­i­ty of U.S. forces deployed here, the region’s top U.S. mil­i­tary offi­cer said. 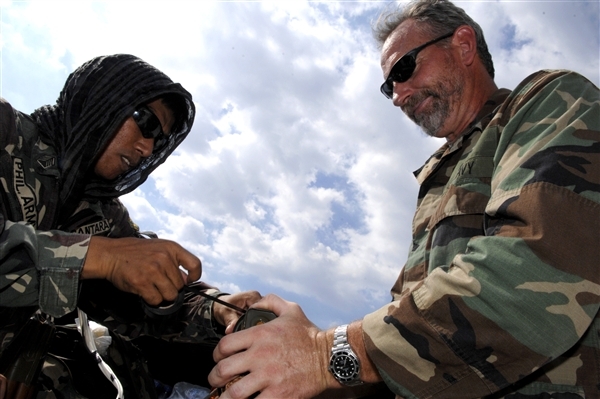 Navy Senior Chief Pet­ty Offi­cer Gary Myers, right, and a Philip­pine army bomb tech­ni­cian pre­pare dyna­mite for a demo­li­tion exer­cise Feb. 20, 2010, in Cota­ba­to, Philip­pines. Myers and his explo­sive ord­nance dis­pos­al team are deployed to Min­danao Island, Philip­pines, to train and assist the Philip­pine armed forces in coun­terin­sur­gency oper­a­tions. But unlike coun­terin­sur­gency oper­a­tions in Iraq and Afghanistan, U.S. troops here work strict­ly in a sup­port­ing role to the Fil­ipino armed forces and are not per­mit­ted to par­tic­i­pate in kinet­ic oper­a­tions, Army Col. Bill Coul­trup, com­man­der of Joint Spe­cial Oper­a­tions Task Force Philip­pines, said Feb. 20 in an inter­view with Amer­i­can Forces Press Ser­vice. Since the return of U.S. forces to the Philip­pines in Decem­ber 2001 — the Unit­ed States closed its bases here in 1991 — troops have used their knowl­edge and exper­tise to empow­er the Philip­pine mil­i­tary and local pop­u­la­tion to stand against ter­ror­ist net­works here, Coul­trup said. Ter­ror­ist orga­ni­za­tions such as Abu Sayyef, Jamaah Islamiyah and oth­er groups con­nect­ed to al-Qai­da had trained and found safe haven here pri­or to Sept. 11, 2001, and the U.S. military’s sub­se­quent arrival. Today, those groups main­tain a strong pres­ence in small num­bers and have had some suc­cess with road­side-bomb and small-arms attacks against the Philip­pine forces. Still, Coultrup’s troops only can pro­vide sup­port. The Philip­pine con­sti­tu­tion pro­hibits U.S. troops from active­ly engag­ing in direct com­bat oper­a­tions here. Despite this chal­lenge, Coul­trup said, his 500-mem­ber task force has been suc­cess­ful in improv­ing local civil­ian and mil­i­tary capac­i­ty through joint devel­op­ment projects and coun­terin­sur­gency train­ing. “The key is win­ning over the [local Fil­ipinos] to let them know that [their] mil­i­tary is not down here to stomp on folks, but to bring a bet­ter life,” Coul­trup said. About 80 per­cent of the task force’s oper­a­tions involve human­i­tar­i­an assis­tance such as engi­neer­ing projects and med­ical and vet­eri­nar­i­an care. These oper­a­tions also are led by Philip­pine forces to build sup­port for the nation­al gov­ern­ment in trou­bled areas. The remain­der of their focus is train­ing Philip­pine troops, which presents anoth­er set of chal­lenges. The armed forces here are poor­ly financed and are under-strength in terms of what many may con­sid­er is need­ed for a suc­cess­ful coun­terin­sur­gency cam­paign, Coul­trup said. Also, coun­tert­er­ror­ism oper­a­tions in the south aren’t even the nation­al government’s top pri­or­i­ty for the Philip­pine mil­i­tary, he explained, not­ing the ongo­ing com­mu­nist upris­ing here to over­throw the nation­al gov­ern­ment. Progress may not be com­ing along as quick­ly as many here would like, but it is being made, said Coul­trup, who’s been the task force com­man­der here since Octo­ber 2007. Doing the job right and empow­er­ing the Philip­pine army to be “out in front” is more impor­tant than how long it takes, he added. “It does take time,” he said. “You’re try­ing to change an entire gen­er­a­tion of peo­ple. All they’ve known is the law­less­ness [and] the lack of secu­ri­ty. And to help improve that secu­ri­ty and the liveli­hood of these folks does take time. Has it got­ten bet­ter? Absolute­ly it has, although it’s not as fast as some folks here would like.